How do I create an effective therapeutic exercise program? Rehabilitation programs should always aim to be low-risk, high demand (Mendiguchia & Brughelli, 2011). Also, we need to understand the environmental and personal factors that can aid decisions about appropriate interventions between patients that present with seemingly with similar musculoskeletal complaints. For example, a patient’s physical environment, workplace, or comorbidities, education and life experiences. We do this through the manipulation of the intensity, duration, frequency, mode volume, and specificity of activity (Hoover, VanWye & Judge, 2016). 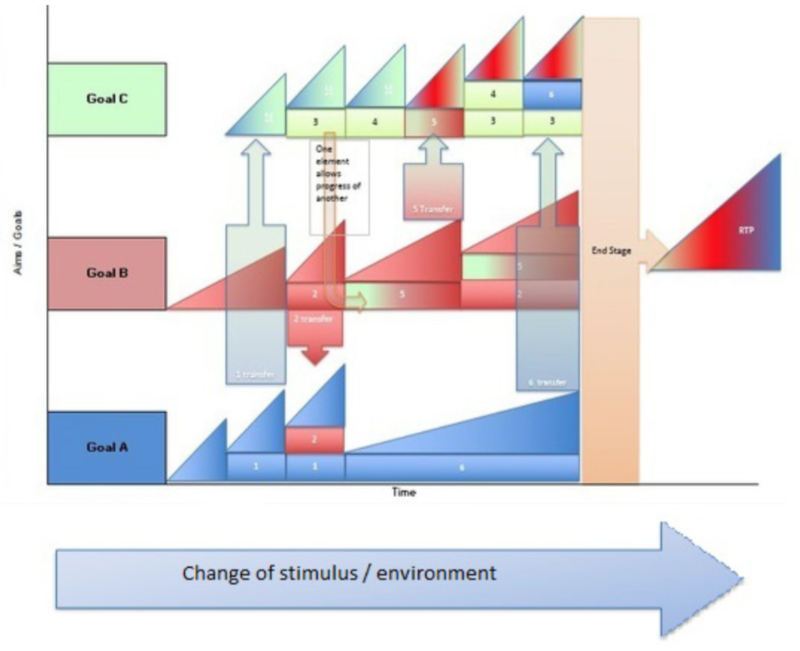 ‘A theoretical model for exercise progressions’ (Blanchard & Glasgow, 2014 & 2017) which provides a visual representation of exercise progression and how they are incorporated into a larger program. ROM and isometrics are the most beneficial types of exercise in this phase. Controlled and progressive mobility is indicated to remodel tissues along the lines of tensile strength (Prentice, 2011). The timeframe at which tissue healing occurs depends on the type of tissue and the extent of the tissues damage. Inflammatory phase: What does this mean for exercise prescription at this phase? Exercise aims to control inflammation through muscle contraction, in a pain-free range of motion to help minimise fibrosis (Anemaet & Hammerich, 2014). However, if pain is reproduced in this stage, it may promote further tissue damage. Can be conducted in a PROM, AROM or A-AROM. Apply a gradual increase in stress on tissues to promote mechanotransduction and Wolff’s Law – tissues respond to the stressors placed upon them. Proliferative phase: What does this mean for exercise prescription at this phase? Maximum strength hasn’t occurred during proliferation – the tissues integrity is restored with type 3 collagen before it is replaced by type 1 collagen in the repair and remodelling phases. Therefore, ROM and strengthening exercises must be continuously monitored for aggravation of symptoms or signs of inflammation. 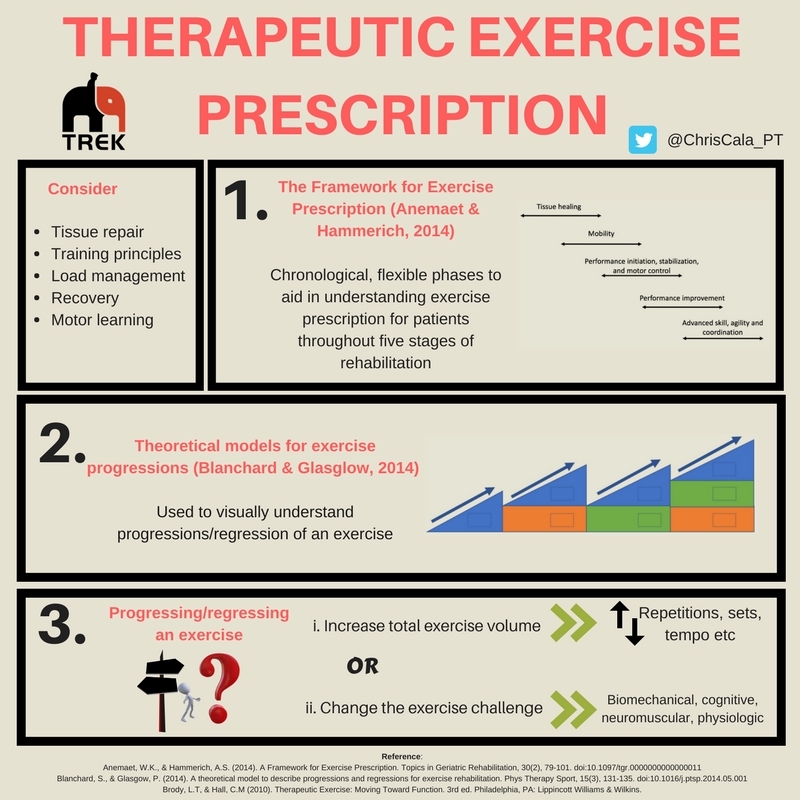 Repair and remodelling phase: What does this mean for exercise prescription at this phase? As the remodelling phase begins, more aggressive active range of motion and strengthening exercises should be incorporated to facilitate tissue remodelling and realignment along the lines of stress. Range of motion and muscle contraction exercises are valuable interventions, although the risk of further injury still exists and can ultimately delay tissue healing. Intensity should be low, and the duration kept short, with continual monitoring of patient symptoms. Progressively increasing intensity is still very important. Some patients can skip straight to this phase if signs and symptoms of inflammation and if initial proliferation stages have occurred. If signs of inflammation have disappeared, are showing signs of decreasing, or are not worsened with the mobility activity for greater than 24hours, patients can progress to this phase. Exercises in this phase can include ROM exercises, stretching exercises, or even eccentric exercises for lower limb mobility (O’Sullivan, McAuliffe & Deburca, 2012). Determining which ROM exercise to use is dependent on patient irritability and what type of mobility impairment is present (Brody, 2012). For example, a patient may present with restricted range due to joint restrictions, pain, muscle or oedema, hypermobility or joint instability. If there is a mobility restriction, it should be determined if it is due to an arthrokinematics limitation (how the joint moves – generally treated with a joint mobilisation intervention), or a osteokinematic limitation (how the bones move – generally treated using ROM exercises). ​Forcing joints through bony restrictions, recent trauma, acute inflammation or infection is contraindicated. Furthermore, mobility exercises are not required in all patients, e.g. patients with a spinal cord injury may not benefit from stretching of the hamstrings as they might utilise them for stability in sitting. Some patients can skip directly to this stage if signs of inflammation are absent, decreasing, or are not worsened with the introduction of these exercises for greater than 24hours. Patients should however be in proliferative or remodelling stages of healing. Full mobility is also not required to begin this stage, but a pain-free range to exercise is essential. Exercises in this phase are completed daily, with a high number of repetitions and a low weight (<50%1RM for isotonic exercises OR 25-50%MVC for isometrics) which allows the body to maintain a predominately aerobic supply of energy. Successful muscle initiation requires neural, vascular, metabolic and muscular contribution and is concerned with the physiological sequence of events of a muscle contraction. Muscle contraction and initiation are essential to enable full tissue healing as they induce tissue adaptation, introduce stress and aid in joint stability and motor control for functional activities. Concentric, eccentric and isometric exercises can also be used in this phase. To distinguish their use between phases, the dosage parameters are manipulated. This phase requires specific and accurate prescription dependent on the functional tasks that are required – this will include what biomotor abilities are most involved in this functional task. For example, strength, hypertrophy, power or endurance and muscle contraction type. While there is the crossover effect within biomotor abilities, it is important to apply the principle of specificity to the patient’s functional limitations to determine the training goal, as this will result in the best outcomes (Mangione, Miller & Naughton, 2010). 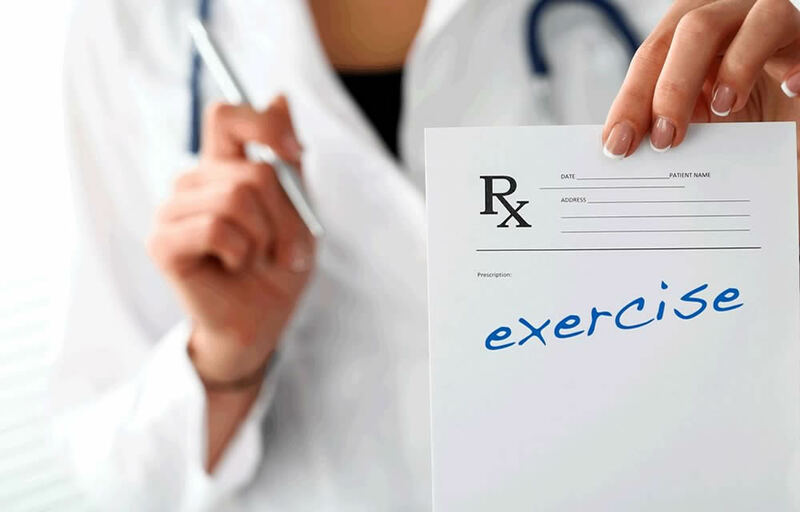 Consideration of contextual factors that can impact on exercise prescription should be considered which allows the clinician to improve their exercise dosages to compliment these factors by adjusting for daily activity loads (Brody, 2012). What environmental (i.e. work demands) and personal factors (i.e. unsupportive family, work ethic) are present? Do these positively impact or negatively impact rehabilitation? Once the training goals component has been identified, the muscle action (concentric, eccentric or isometric), load, reps & sets, positioning, order, rest periods, velocity and frequency parameters are decided. Once patients have progressed through rehabilitation and have approached near-normal muscle performance without signs of tissue injury or mobility limitations, they begin to integrate components from previous phases to higher-level coordination and skill movements by adding plyometrics or manipulating body position, surfaces, resistance, agility or coordination. NOTE: This stage is not solely for those returning to competition or sport. Plyometric exercises produce power through combining strength and speed which utilise the physiological properties of stretch reflexes and the musculotendinous-junction (MTJ) to increase motor unit recruitment and ultimately force production (Turner & Jeffreys, 2010). They can act as injury prevention, can improve joint ROM and flexibility and especially important for movements requiring a quick transition from concentric to eccentric muscle action. 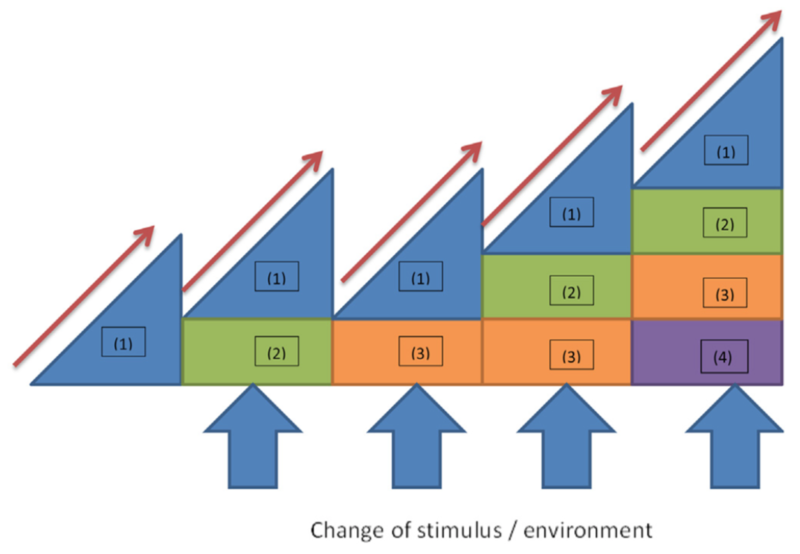 These rehabilitation models can be used for visually understanding progressions/regression of exercises. They can be used as adjuncts to the Framework of Exercise Prescription. List the goals of rehabilitation that will lead to achieving functional goals along the vertical axis. These goals will be both achievable and challenging and can be an individual skill, or a set of skills e.g. improve ROM or hopping or return to running. The horizontal axis represents time and the vertical axis the level of difficulty of the exercise. 2. What are the potential negative effects of the exercise for that impairment? 4. Can it lead to future impairment if left untreated? – What range or position does the muscle have to function? At what speed? – What is the patient’s training history/current status? – What is the most appropriate way to load tissues for this patient given their history/current status? – What precautions are present? – What stage of healing is most likely? Ultimately, there are two overarching ways to progress the initial exercise to continuously challenge the patient but must remain in balance with exercise load and daily load (optimal loading). NB: While volume is not directly manipulated, the type of stress on tissues is changed and challenges the motor control of the initial exercise. Therefore, there should be a concurrent regression in the duration, speed, distance and other parameters previously prescribed to protect healing tissue and to minimise potential overloading. 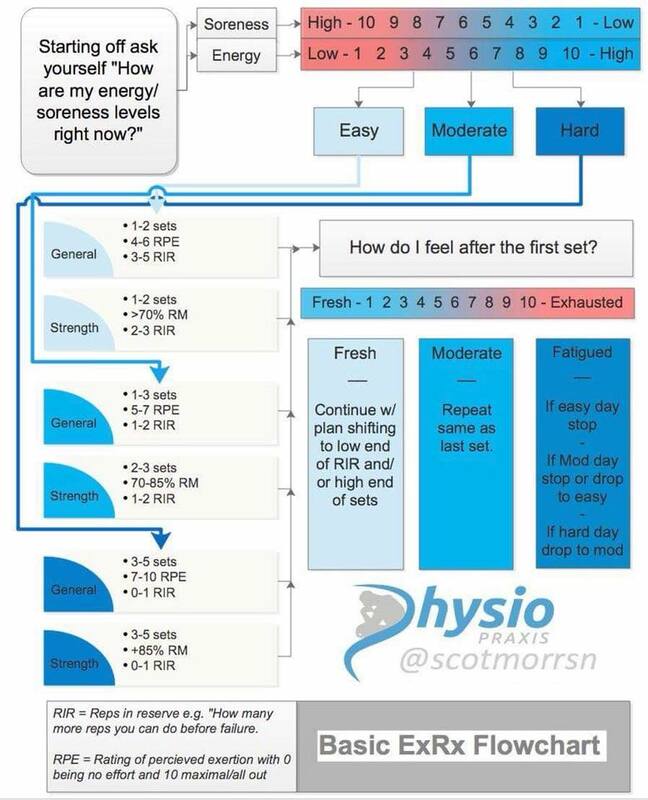 NB: It is common in patients who are at later stages of rehabilitation and those who demonstrate stable symptoms, to progress exercises using a flexible approach with an increase in volume being balanced concomitantly with a challenge variable. 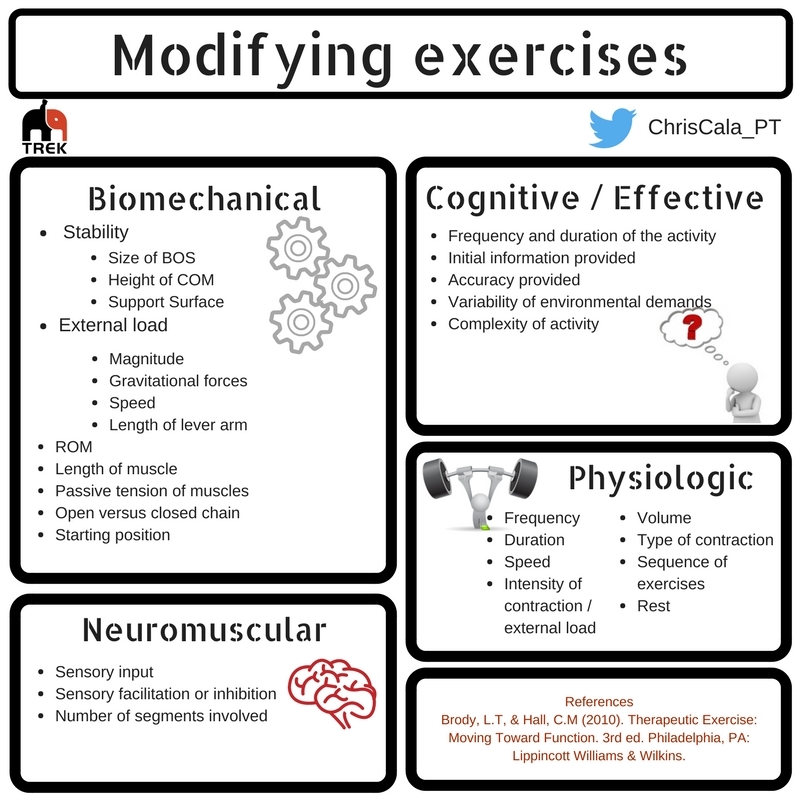 Conversely, if the patient demonstrates unstable symptoms, exercise changes should be kept to a minimum to ensure changes to symptoms can be identified and modified. Mangione, K.K., Miller, A.H., & Naughton IV. (2010). Improving physical function and performance with progressive resistance strength training in older adults. Physical therapy, 90(12):1711-1715. Doi: 10.2522/ptj.20100270.